There are injustices all around us. We see injustice in big ways, in small ways, in the world around us, and in our own experiences. I tend to see them in technicolor more often than I'd like. Being alert to the wrongs of our world is challenging, but being empowered to do something about it is everything. 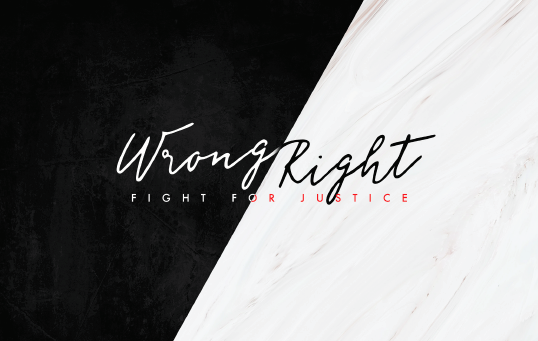 That's why I was incredibly excited to write this series, "Wrong/Right", for middle school and high school students and the Stuff You Can Use gang. Teenagers are some of the best people on the planet to identify injustice and what's wrong in this world. The news is often highlighting ways teenagers are pointing our society to a more just way of life together. Justice is hugely important to God, but it's not always easy to know what justice looks like. This week, you'll help students see how Jesus fought for justice and how He invites us to do the same. Joseph's life was a testament to God's faithfulness in the midst of difficulty. This week, you'll challenge students to consider how the justice of God can transform our response to the injustices we face. If there is anyone in Scripture who has been the victim of terrible injustice, it's Jesus. This week, you'll encourage students to respond to one of Jesus' most challenging teachings: the importance of forgiving our enemies. Jesus' definition of "blessed" was pretty different from our definition today. This week, you'll help students see that, in God's Kingdom, being blessed isn't connected to your possessions but to whether or not you are fighting for justice on behalf of others. This 4-week series is just the tip of the awesome iceberg with the Grow Curriculum. It's packed with series that help students form a positive identity, find belonging, and uncover their uniqueness in the world. If you are looking for a solid, customizable curriculum for your student ministries, check out the Grow Curriculum. If you have any questions, holler at me or the book people at Stuff You Can Use. It's solid stuff. I'm a fan.